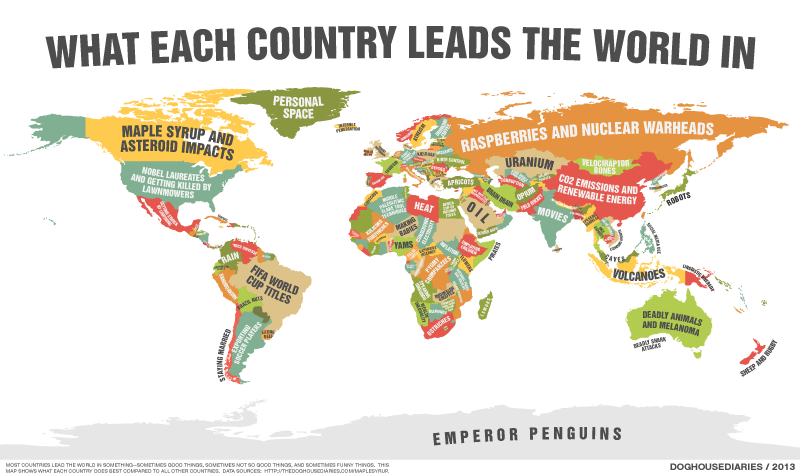 Every country is Number One when it comes to something, and this map from webcomic Doghouse Diaries just what all those somethings are. You can see a huge, zoomable version of the map over on the comic's website and see the list of sources here. These factoids are pulled from Wikipedia, so know that the map is only as accurate as the Wikipedia articles it's based on—although there have been changes made to the first version of the map to correct outdated information. Of course, it's not all maple syrup and raspberries; some countries have some rather tragic distinctions.